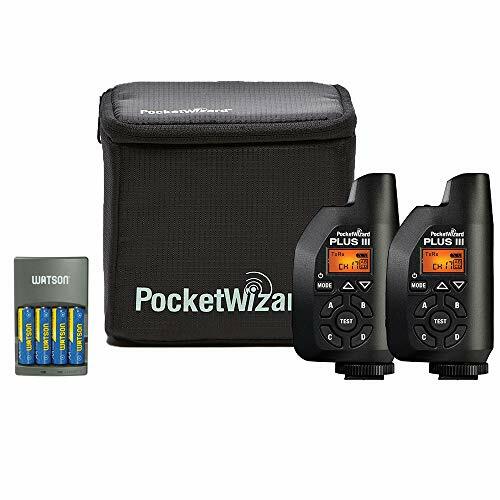 This Plus III Bonus Bundle was put together by PocketWizard to offer photographers a multi-channel, multi-zone, triggering option with an exceptional wireless range of up to 1640'. The bundle includes two Plus III radio transceivers, a G-Wiz Squared Bag, and a Cable Kit with a PC Sync 1/8" mini to 1/4" phono. 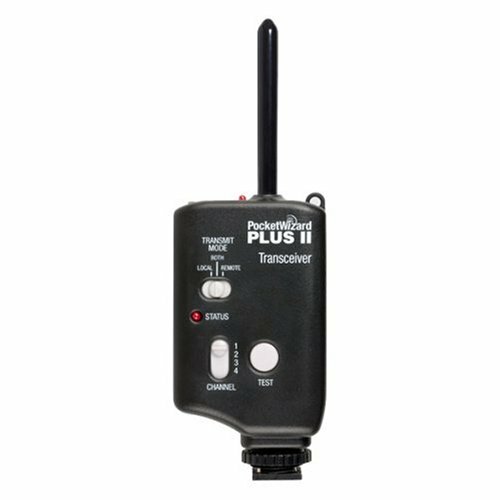 The black PocketWizard Plus III Transceiver is a highly versatile and robust radio trigger that is compatible with all prior FCC-version PocketWizards, as well as most flash and camera systems. Featuring 32 channels to choose from, this transceiver is simple to use in even the busiest of situations. 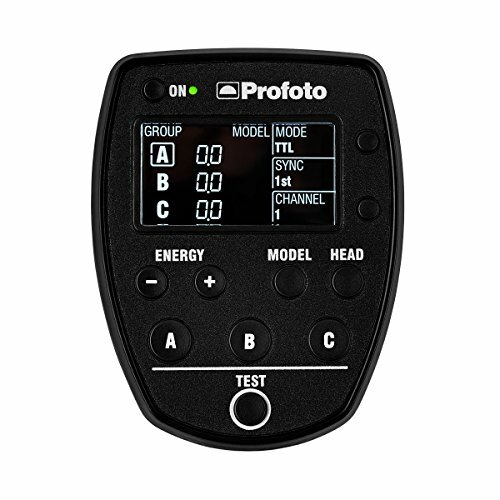 Wireless remote control is possible through the use of Quad-Zone Triggering, which allows you to manage up to 4 zones of remote PocketWizard-enabled cameras or flashes from one position. Without having to leave camera position, you can activate and deactivate groups of flashes quickly and easily. Plus a Watson 4-Hour Rapid Charger comes with four 1.2V, 2300mAh AA NiMH batteries that are rechargeable up to 1000 times. You can use it to charge four of the included batteries or optional AA NiCd, AAA NiMH, or AAA NiCd batteries. The charger's integrated micro-controller ensures that each battery is charged to its full capacity, and automatic charge cut-off prevents overcharging. 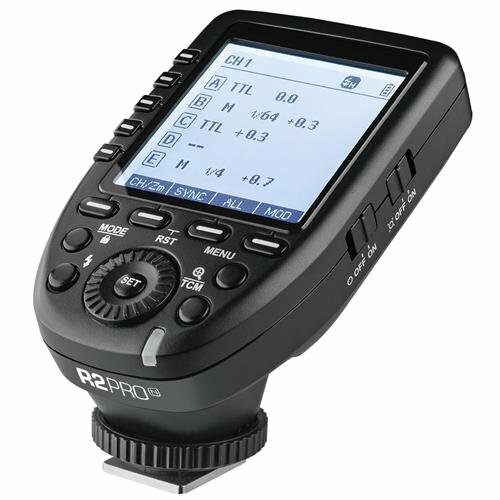 The Flashpoint exclusive R2 Pro Mark II N wireless flash trigger is the definitive dedicated transmitter for the R2 Family of Flash - The ultimate command center for Nikon cameras to control Flashpoint R2 wireless system devices. The first of its kind - custom designed and created - a dynamic, direct access, dead-on control to every aspect of the linked TTL flash. The breadth of capabilities suits the vision of every strobist on the quest for lighting excellence. Every whim and wish has a direct button ready for action, providing instant response to no less than eighteen novel and familiar R2 features. Direct! No scrolling through menu options for the right selection. Touch the icon, and the agile Pro Mark II performs. Confident handling of precise control is the perfect complement to high-performance imaging. Plus, the newly fine-tuned smartphone APP endows the savvy Apple or Android mobile photographer with pure shooting pleasure, taking R2 technology one step further. Manage flash like never before. The proprietary Pro Mark II presents expanded precision, derived from the fabulous FP R2 Pro version. Centrally located Group buttons surround the generous Select Dial, 10 Quick-Touch dedicated function buttons, built-in Bluetooth that links to the graphical FP Smartphone APP, isolated single Group open flash test, multiple dual purpose button assignment and the list of novelty goes on. It is the R2 device that will never stand vanquished by innovation. 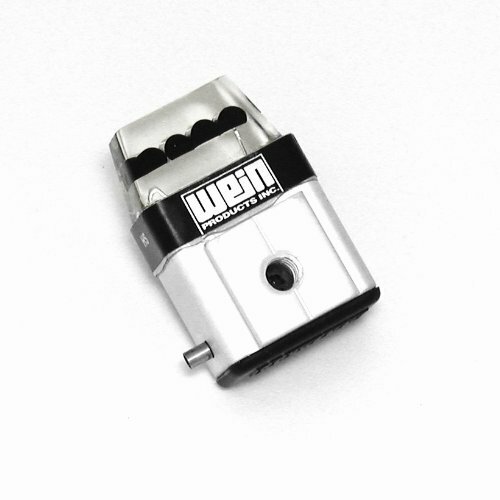 Whether you want to trigger a shoe flash or a gaggle of 4800 watt/second packs, Wein is the best choice. This unit is solid, tough and reliable with up to a 150 ft range. The Shoe mount design fits most on camera flash units. The best part of this unit is that you can leave the batteries in the bag; this Wein slave does not need them. 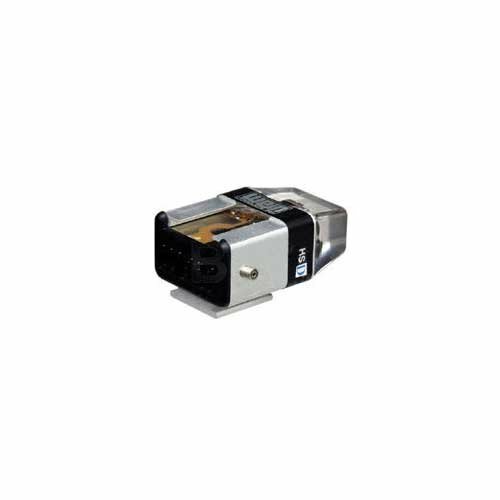 Attach directly to foot of any shoe-mount flash for direct connection or connect a standard PC cord to the side mounted PC terminal. Features a standard foot on the bottom and 1/4-20" standard tripod thread. Key Features built-in ambient light filter for outdoor use. Constructed of aircraft aluminum and solid epoxy virtually indestructible. Integral 1/4-20 threaded socket for tripod, monopod or light stand mounting. PC terminal for use with non-shoe flash units. 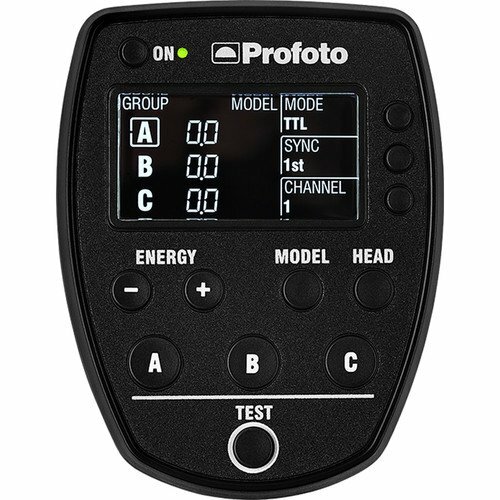 The key to wireless triggering and TTL remote control is Profoto's Air Remote TTL-C transmitter, available for Canon cameras. Operating on 2.4GHz bandwidth, the transmitter, really a controller, has 8 frequency channels and with 3 groups per channel and a range of up to 330' for TTL triggering and 1,000' for normal triggering. Each channel has power ratio capability of +/- 2 stops. If you prefer to use manual you have +/- 9 stops power variation. You've also got modeling light, unit shut-down and first or rear curtain control. 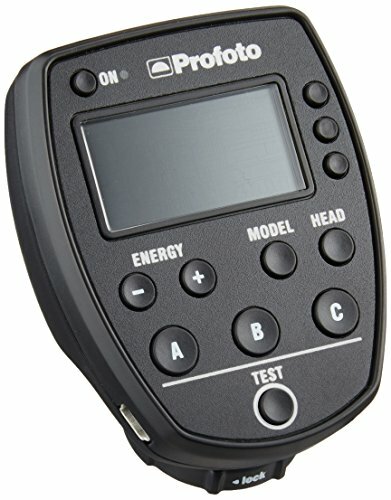 Both the TTL-C and the B1 500 Air TTL have mini-USB connectors for firmware updates directly from Profoto's website. The Air Remote TTL-C will also trigger non-TTL Air heads and packs from Canon cameras but without the TTL feature. 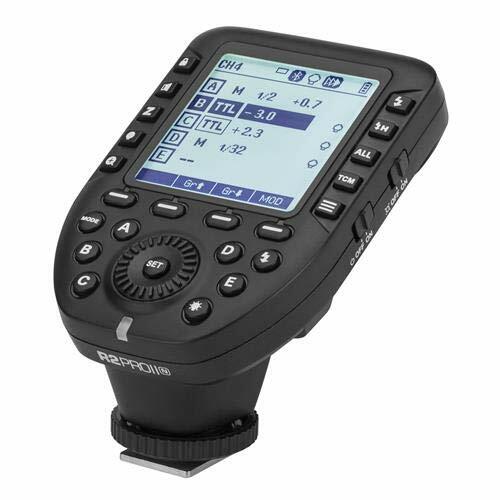 The Flashpoint R2 Pro C wireless flash trigger (Godox XPro-C Flash Trigger Transmitter with E-TTL II 2.4G Wireless X System HSS LCD Screen for Canon) is the ultimate dedicated light master for The R2 Family of Flash - The absolute command center for Canon EOS cameras to control all Flashpoint R2 wireless system devices. Now, R2 Canon photographers can enjoy unparalleled flexibility and control over multiflash strobist setups, right from their DSLR. 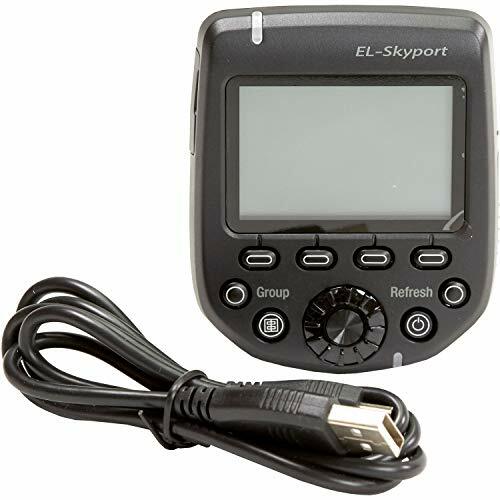 Touting features such as a large and brilliant backlit dot matrix LCD screen, displaying all 5 Groups simultaneously, with direct access buttons. The on-camera transmitter gives photographer, power to direct the entire R2 Family: Zoom and Streaklight speedlights, Lithium battery powered eVOLV strobes and XPLOR monolights, and AC Rapid studio monolights. Godox XPro-C Flash Trigger Transmitter with E-TTL II 2.4G Wireless X System HSS LCD Screen for Canon DSLR Camera, Fully support TTL autoflash. 1/8000s high-speed sync, multi flash, manual flash, flash exposure compensation, TCM transform function, magnification function, one-shoot & multi-shcx)t setting, group modeling lamp control, group zooming, adjusting all groups1 output value simultaneously, etc. Attach this small unit to your Olympus camera's hot shoe to wirelessly integrate your Profoto AirTTL Flash with your camera. In TTL Mode, you just point and shoot and the Air Remote TTL-S will communicate with the flash to automatically give you a perfect exposure. It is as easy as it sounds.For more precise control, switch to Hybrid Mode. This allows you to first shoot with TTL to get a technically perfect exposure and then switch to Manual Mode with the same readings and settings and do whatever creative adjustments you feel like doing. It is a huge time saver. Plus you can leave that light meter at home! Comes with patent-pending Profoto High-speed Sync technology faster, more powerful and more consistent than any other HSS solution on the market. Rotolight HSS transmitters for optimized for Rotolight by Elinchrom. Wirelessly triggers NEO II. The PocketWizard Plus II transceiver system does more than cut the cord. The PocketWizard Plus II can wirelessly trigger lights and/or cameras within a range of 1600 feet of the transceiver. Utilizing advanced wireless technologies, four 16-bit, digitally-coded channels are available for selective firing of lights, or when working in crowded environments. If speed is a concern, images can be captured at a rate of up to 12 frames-per-second, which outpaces most currently-available cameras, pro or otherwise. 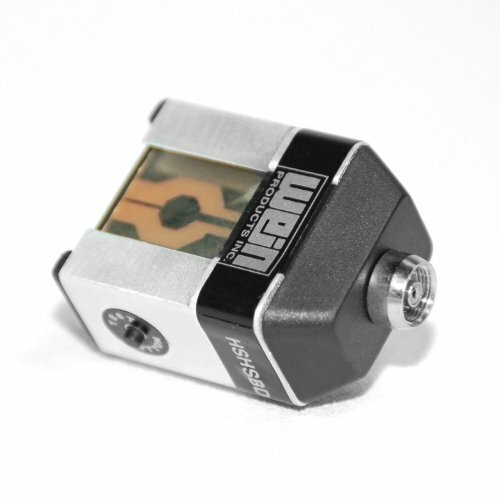 Ultra-fast microprocessors allow for top sync speeds of 1/250th-second for focal-plane shutters and 1/500th for leaf shutters.The PocketWizard Plus II is compact, with a short, unobtrusive, rubberized antenna. The total height of the transceiver and antenna is less than 6.5 , and it weighs in at 6oz including the batteries. To ensure a secure fit to your camera or bracket, the Plus II features sturdy locking rings for hot shoes. Power is supplied by 2 AA batteries, which are good for about 60 hours of playtime. An optional AC adapter allows for continuous, unlimited shoot time. Whether you want to trigger a shoe flash or a gaggle of 4800 watt/second packs, Wein is the best choice. This unit is solid, tough and reliable with up to a 100 ft range. This slave plugs directly into the pc connection of you sync cord allowing connection with most strobe units. The best part of this unit is that you can leave the batteries in the bag; this Wein slave does not need them. Wein Optical Slaves are the classic solution for wirelessly syncing virtually any amount of flashes to your camera. 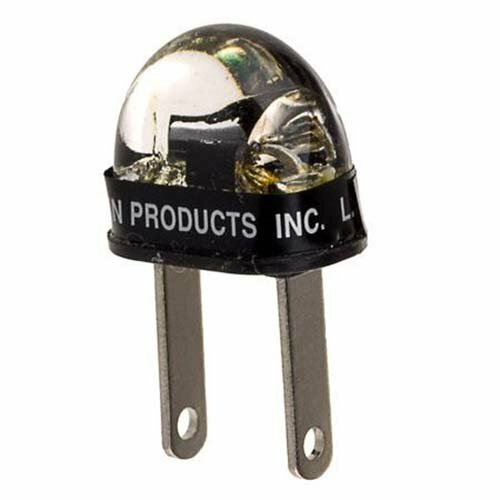 Wein Optical slaves will fire in sync with the first white light or infrared pulse that it detects. If your "key" flash emits a pre-flash Wein recommends using: the camera in manual mode so that no pre-flashes are emitted. If your key flash emits a pre-flash Wein recommends using: the camera in manual mode so that no pre-flashes are emitted. (SSHSHS) SAFE-SYNC HOT SHOE TO HOT SHOE Mounts Directly to camera hot shoe and has hot shoe on top for flash Safe Syncs safely reduce any electronic flash source from up to 400 volts to less than 6 volts to the camera sync input. This is absolutely mandatory for all high end and especially all Digital Cameras. Helps to keep your camera out of the repair shop. PocketWizard MultiMAX II Transceiver, Remote Control Radio Slave. 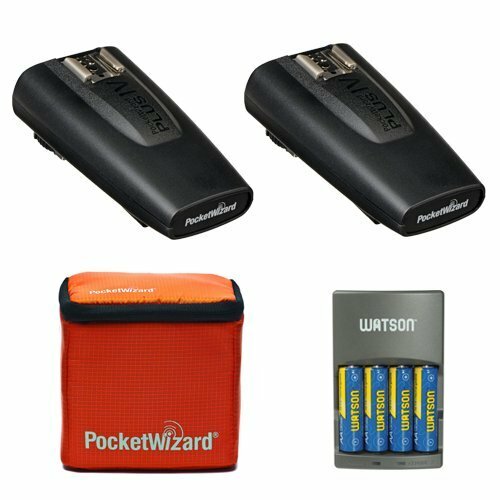 If your needs go beyond simple triggering, you need the PocketWizard MultiMAX II Transceiver, the most advanced wireless triggering system available. With thirty-two Standard Channels and four separately controllable zones, as well as 20 ControlTL Channels with three zones, the MultiMAX II Transceiver is the ideal solution for working in crowded venues or with multiple lighting set-ups. Featuring sophisticated trigger time control functions and transceiver communication capabilities, the MultiMAX Transceiver unleashes unlimited creative possibilities for the professional or serious amateur photographer. Extreme versatility - Thirty-two channels with Selective Quad-Triggering allows you to work in crowded venues or with multiple lighting set-ups. Reliability - The most reliable triggering system available. Infinite Intervalometer - Capture as many exposures as you want for as long as you want. Ultimate Creativity - Add depth of field or stroboscopic effects with Multi-Pop or create uniquely timed images using precision flash delays. Sequential Triggering - Trigger 16 cameras or 16 flashes with SpeedCycler. - Compatible with ALL PocketWizard radios.